Spondylolisthesis is a common cause of back pain, affecting some 3 million people. It means a spinal bone, or vertebra, has slipped out of place and in front of the one below it. The name (SPONDY-lo-lis-THEE-sis) comes from the Greek words spondylo, meaning spine, and listhesis, meaning slippage. “Spondy” is a disorder of extremes: it can cause no symptoms at all or make performing ordinary tasks like sitting and walking excruciating. Your experience with spondylolisthesis may cause sciatica pain or no symptoms as mentioned above. Or your symptoms may be different. Like many complex spine conditions, spondylolisthesis conditions are not a one-size-fits-all. This disorder can be the result of heredity, a childhood accident that causes pain later on, or the effects of aging. Doctors classify spine misalignment into six types. This condition is further broken down into grades of vertebral slippage. Misalignment of the spine causes a wide range of symptoms. The most common are a lower back pain or tenderness that won’t go away, thigh pain, foot tingling, pain that radiates down the leg, and muscle spasms in the hamstring or buttocks. 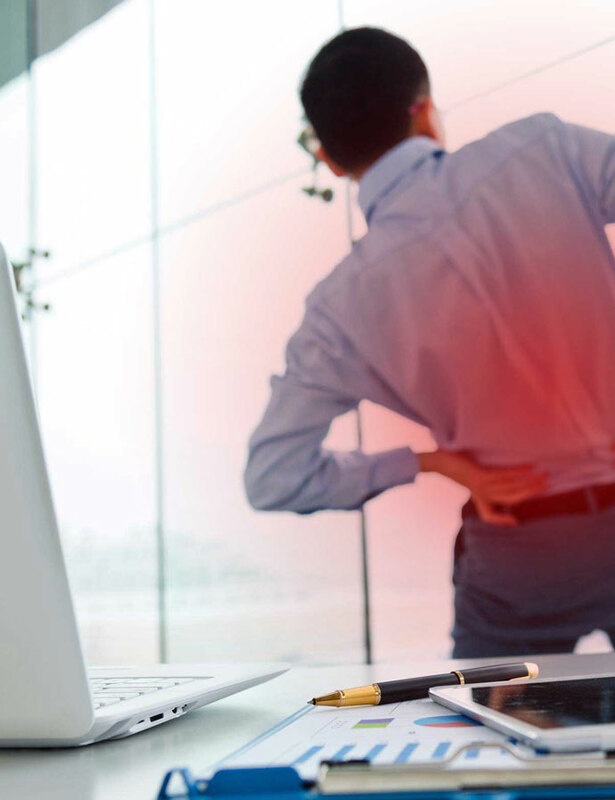 These symptoms can mimic other low back pain conditions, such as spinal stenosis and herniated disc, so your specialist will order x-rays or an MRI to make the proper diagnosis. It is important to treat the symptoms of spondylolisthesis; otherwise, this condition can progress. It can cause chronic pain and permanent damage, including weakness or leg paralysis. Another complication, known as kyphosis or “roundback,” results when the upper part of the spine falls off the lower half. Medications – Over-the-counter or prescription painkillers and anti-inflammatories can help many patients. Back brace – This can help stabilize the spine, relieve stress and promote proper posture and alignment. They can be purchased online. Exercise and physical therapy – Your provider can prescribe specific exercises or PT for spondylolisthesis to strengthen the muscles supporting the spine. If these don’t relieve the pain, your general practitioner might refer you to a pain management specialist such as Physician Partners of America. Our doctors can try a next-level approach, such as epidural steroid injections. These deliver a combination of anti-inflammatory steroids, pain medicine and saline directly to the source of the pain. Some patients need a few treatments to help them complete a prescribed physical therapy program; others elect to get the injections regularly. The effects can last from a few weeks up to a year. For people with extreme pain that interferes with quality of life, surgery may make a big difference. The most common combine spinal fusion with nerve decompression. Fortunately, this can be done in a minimally invasive way: incisions are usually less than once inch long, muscles are gently spread apart instead of cut and torn, and tiny instruments are introduced through a narrow series of tubes. Spinal fusion is used to stabilize the area between two vertebrae in the back. Most often it involves the use of a bone graft, artificial disc, and an internal bracing system that supports the vertebrae during the healing process. Because the lumbar, or lower, spine is a common site for spondylolisthesis, a number of procedures have been developed to address it. The three main types all end with LIF – lumbar (lower back) interbody (disc space) fusion (stabilization). ALIF – Anterior lumbar interbody fusion is performed from the front (anterior) of the body through the abdominal area. TLIF – Transforaminal lumbar interbody fusion is performed from the back. XLIF – Lateral lumbar interbody fusion is performed through the patient’s side to avoid the major muscles of the back. Because they are minimally invasive procedures, muscle tissue is spared, making recovery quicker and less painful than open back surgery. You can usually walk out of the procedure room the same day, although you will have to take it easy: full healing form a fusion can take up to eight months. Talk with Physician Partners of America spondylolisthesis specialists about all your options for overcoming the pain of a misaligned spine.